In my previous post I revealed my untutored astonishment that there are so many versions, or personalities, of the Trilby cocktail, and focused on the vermouth version. I was prepping a Manhattan the other evening, and it seemed the obvious opportunity to check out Trilby’s bourbon alter ego. Stir with ice, strain into a well chilled cocktail glass. Garnish with orange. This is, of course, a Manhattan with orange bitters instead of Angostura. As noted in the previous post, Jamie Boudreau traced this version back to the 1935 Old Mr. Boston’s Official Bartenders Guide . 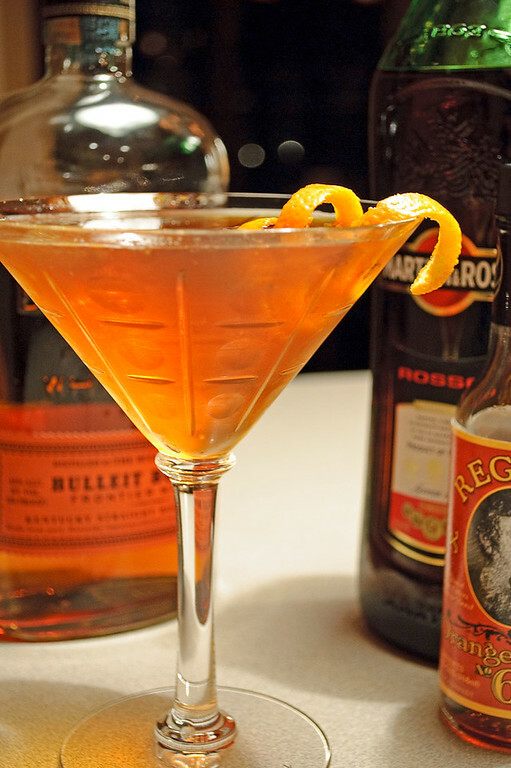 Compared to the standard Manhattan, the bitters substitution makes it seem lighter and sweeter, and much less earthy. The Trilby is an acceptable bourbon cocktail, but I missed the complexity and spiciness that Angostura brings to the party in a proper Manhattan; with that in mind, the Bulleit seemed to be just the whiskey for this drink, with its extra bit of rye-ish spiciness. “Trilby Cocktail (Bourbon)” at cold-glass.com : Text and photos © 2010 Douglas M. Ford. All rights reserved.